As we have seen above, the various expedition teams made plans on concerning research sites after the collection of information from locals and the antiquities that had already been found. Some of this The information, however, contained mistakes and untruths, and it was difficult for the leaders of the expeditions to decide what was worth believing and what was not. Furthermore, there were more than a few instances in which decisions and action based on inaccurate information determined the fate of the explorers. The Material from the Library Cave of Dunhuang is one such instance. The highly significant substantial number of manuscripts discovered in 1900 in the Library Cave at Dunhuang Mogao Grottoes(15) is today very well known. The first batch of these manuscripts was successfully acquired by Stein in 1907. This was followed the following year by Pelliot’s purchase. Both scholars were to bring their haul of manuscripts back to their countries resulting in an international sensation. It was, the German Le Coq, however, who had first heard about the rumor of the discovery of the Library Cave. 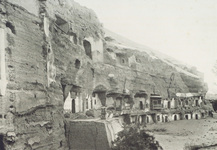 In 1905, as early as two years before Stein visited Dunhuang, Le Coq had already heard about the news from a merchant in Hami where he was staying. Unluckily, at that very time, he had received a telegram announcing the imminent arrival of his boss Grünwedel in Kashgar. If he was to follow the orders contained in telegram to wait for the arrival of his boss then he would have no time to visit Dunhuang, which was a 17 day journey from Hami. To add to the complications, Grünwedel had repeatedly changed his schedule at the last minute, so there was no guarantee that he would even arrive as the telegram stated. Le Coq would have time to go to Dunhuang if he calculated Grünwedel's late arrival. But at the same time, there was no guarantee that Grünwedel would be late. Uncertainty over the news about the discovery of the Library also troubled Le Coq. Until then, he had repeatedly been misled by untruths told to him by the locals. So, he hesitated. Even if he risked being late to meet Grünwedel at Kashgar by going to Dunhuang, there was always the real possibility that the attempt would end in failure. And if he was late for meeting Grünwedel, that was two mistakes instead of one. After debating the decision, he would later recount how he had decided in the following way, "somewhat in despair, I left the decision to Fate by tossing a Chinese dollar: heads win, tails lose! Tails, i.e. the inscription side, came uppermost, and I had my horse saddled and began our journey to Kashgar" (from "Buried treasures of Chinese Turkestan", pp.106-107). Thus Le Coq lost his opportunity to obtain the manuscripts of the Library. Ironically, Grünwedel was in fact late again-- by nearly 2 months.